…that is all you need to work effectively! 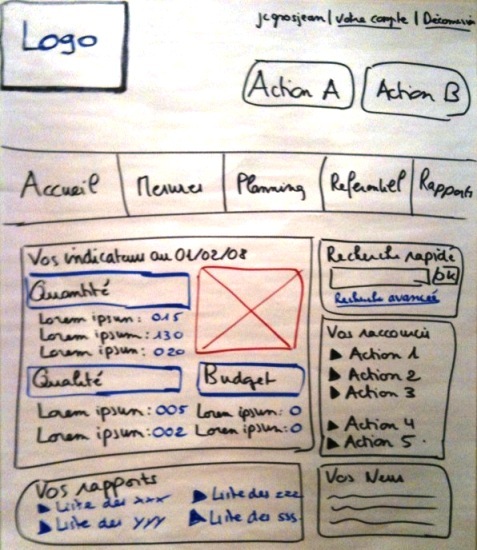 A wireframe is a « low fidelity » prototype. This non-graphical artifact shows the skeleton of a screen, representing its structure and basic layout. It contains and localizes contents, features, navigation tools and interactions available to the user. The winner of the « the best prototyping tool award » is actually… a Trio! to be a communication tool, used during a workshop to facilitate discussion with developers, testers and business actors (Product Owner). So, wireframes help to generate feedback, to see potential problems with an interface and to clarify conditions of satisfaction. are by far the most effective. 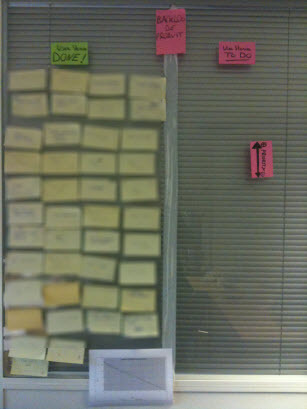 On Agile projects (with short sprint lasting 2 or 3 weeks), this is not only an option! Rapid and valuable prototyping in order to foster collaboration and elicit rapid feedback is a must. 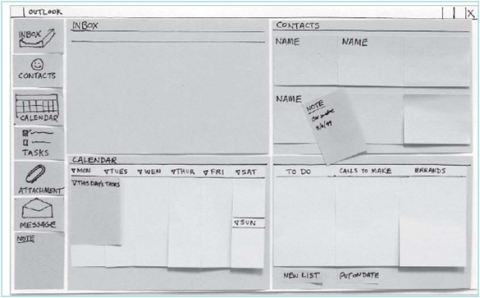 Paper prototyping is probably the fastest and easiest form of wireframes but not the least effective. 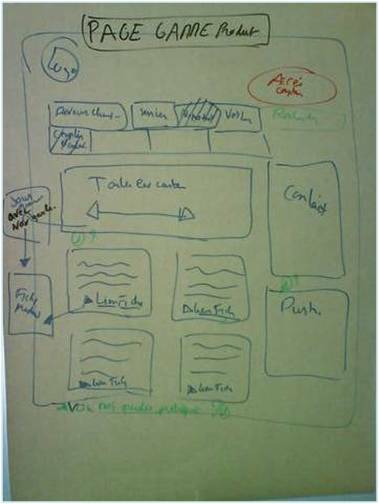 Direct, simple, visual, cheap, enabling rich feedback, paper wireframes focus above all on collaboration and proximity. 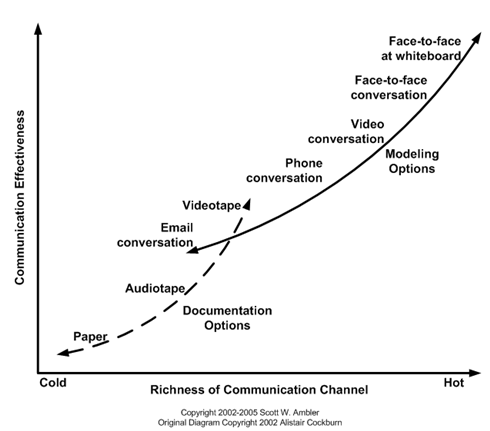 Complexity of the format varies from one context to another, as highly developed paper prototypes can be created with proper equipment, good preparation and facilitation. Interactive paper prototyping sessions offer other benefits: direct manipulation, interactivity, playfulness and creativity. Larger collaborative workshops (focus on prototyping) can be very valuable both for design and testing activities. Teamwork on the whiteboard is one of the most efficient form of communication. 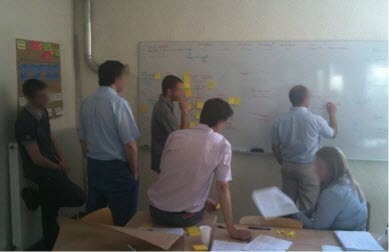 Several specifications workshops take place during an agile sprint. 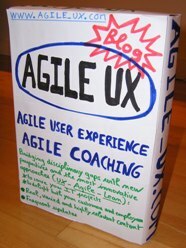 Some are dedicated to the scope (user stories) of the current sprint; other (also called Product Backlog refinement) serve to explore, refine, model collectively user stories envisioned for the next sprint. 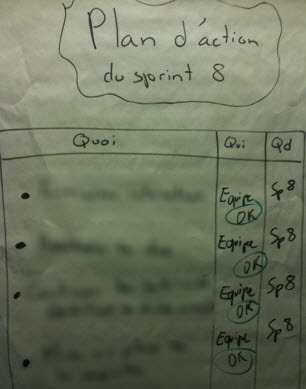 Some teams I coach organize this specification workshop, just in time, the last day of the current sprint (i.e. Friday afternoon) after the Sprint review & Retrospective in order to be ready for the Monday sprint planning. 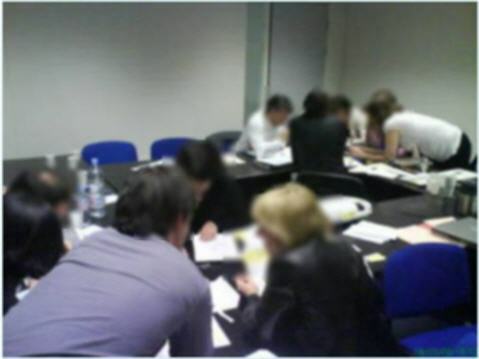 Other teams organize it in the middle of the sprint in order to have time for requirement exploration, testing, business modeling or quick user research…. Design & specification workshops give the necessary context and conversational elements so crucial to User Stories. They enable to illustrate and clarify the conditions of satisfaction while delivering valuable examples. Take a picture of the results with you camera, and you have a useful element to associate with your user story description written in the wiki! 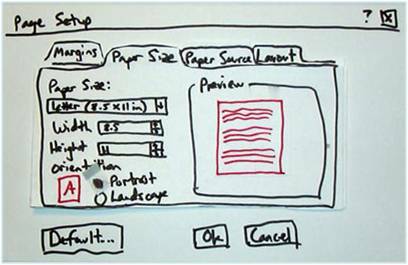 Balsamiq is an electronic tool that I recommend to agile teams (complementary with paper and whitebooard). Easy to use and allowing very rapid sketching, the application presents a large library of UI components (build-in and from the users’ community), many templates, export possibilities and precious plugins for Confluence or Jira users. I use the tool with several co-located team and in distributed contexts offshore via screen sharing: in both cases the contribution of the tool was welcomed by teams and Product Owners « a useful tool that serves human activities« . The sketchy format also has its interest: it lets you focus design conversations on functionality. No risk to forget the reality! 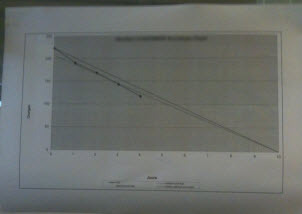 You must focus on your working software deliveries to measure you project progress. 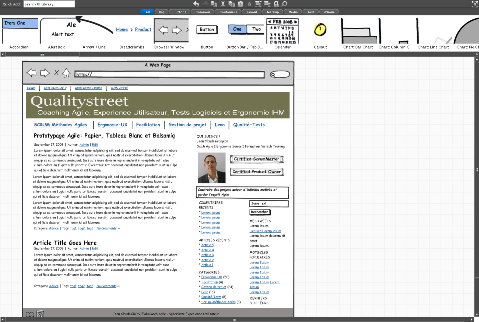 Wireframe is a communication tool. This is not a free tool but the price / quality ratio is excellent. 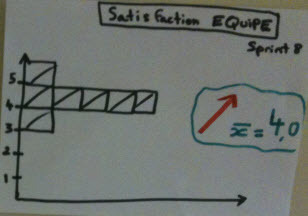 Agile Coaching Tips: My Action Plan is visual, simple and SMART! 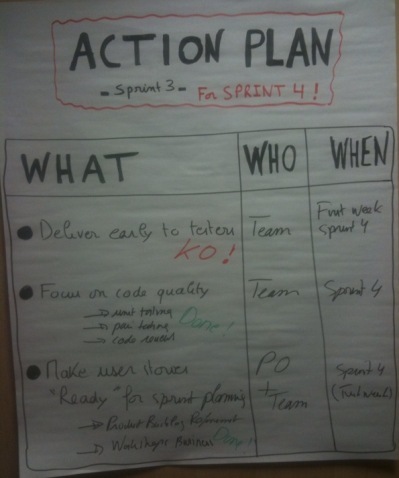 I usually say to Agile teams that the most important outcome of a sprint (or release) retrospective (but also important workshops), is the Action Plan. 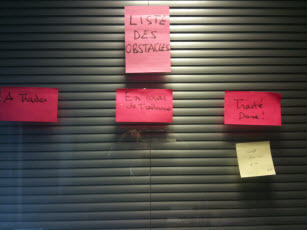 Scrum Retrospective Action Plan. A crucial element of facilitation. Both past and future oriented, the SCRUM retrospective meeting aims to discover what the team did well, understand what went wrong, and to find ways to improve. It’s an important and intense exchange and communication event. But completing an action plan, at the end of the retrospective, is the only way to make it fully successful and to engage the team in a continuous improvement approach (Inspect & Adapt) for better performance. Only a short list of actions (4 max) and three columns that make it simple and effective. Build in collaboration on a large sheet of paper. At the end of the meeting, the action plan will join the team’s information radiator, into the team’s workplace to make it visible every day by everybody’s eyes. Communication is crucial for continuous improvement, and visual management is an effective strategy to make the follow up and to maintain engagement. Then, I like to get the team’s commitment to the plan before closing the meeting and doing the ROTI (Return On Time Invested). I was missing the CLIENT, the primary goal and core foundation of an organization, the means to align employees to a common vision and the key differentiator against competitors. Indeed, in today’s world of complexity and competition, the challenge is not only to deliver value early but mostly to continuously delight his primary customer. This is the only viable purpose to be successful in the long term. For this, the agile organization must be both proactive, active and reactive, supported both by lean, agile and user eXperience practices. Of course « being agile » is also a mindset based on core values: communication, feedback, courage, simplicity, respect and the four from the Agile Manifesto.